Week 22 – A new way to lift your mood in minutes. Mix business with pleasure and join me on a cruise to Alaska in August where you can enjoy breathtaking beauty while learning how to expand the audience for your business, your book, your product, or your art. For all the details, visit here. A new way to lift your mood in minutes. Taking photographs of the things I love is such nourishing self care. 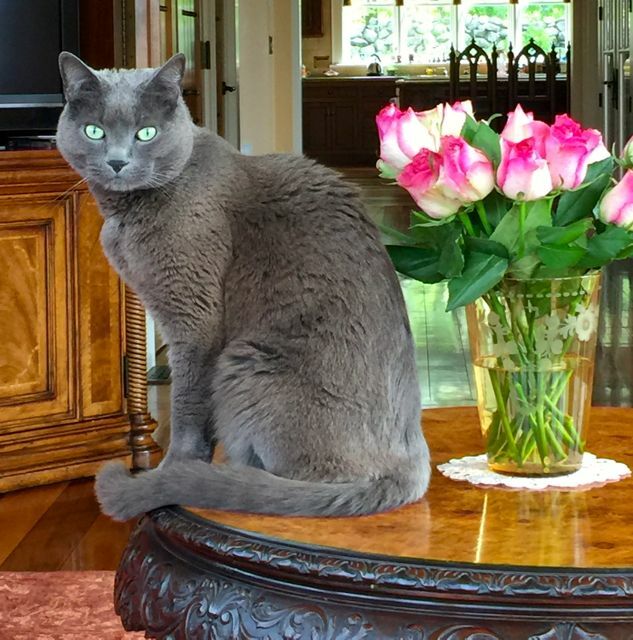 My cat, Poupon, a favorite antique table, and flowers, all make me smile. Let’s see yours. I’ll pick two or three people, get your address, and send you a self-care surprise. Some posted art. Mary Murchison posted the most extraordinary photo of a Mandala she created using plant material. Others posted pictures that announced special events. Debra Payne is having a grandbaby and she posted a fun announcement that included her dog and favorite books. And of course there were lots of shots of furry friends, family members (not so furry), flowers, and nature scenes. Nearly 600 of them so far! Over the next few days I took my time going through every picture. Some made me smile, others made me tear up, or laugh out loud. I could feel my shoulders relax, my heart open, my mood lift. It was a powerful reminder of how what we see and feel changes our physiology. After all, the body is healed and strengthened by beauty, images that evoke positive emotions, and by the feeling of connection we experience when we share what matters most to the heart. Whether you’re grieving a loss, feeling under the weather, or just ready for a good laugh or smile, grab a cup of coffee or tea, sit back, and enjoy the experience for yourself here. Congratulations! Please send your address to chris@cherylrichardson.com and I’ll send you something special this week . Here’s a visit with a little angel in this week’s video. You can watch it here. Thanks, Elizabeth!